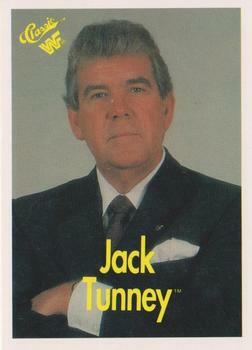 Someone Bought This: WWF President Jack Tunney trading card - WrestleCrap - The Very Worst of Pro Wrestling! That’s right, Crappers- Jack Tunney (@TunOfFun) isn’t just the President of The World Wrestling Federation, he’s the Esteemed President Of The World Wrestling Federation! If you need the rules and regulations enforced, he’s the man you turn to. And don’t you dare forget it. Bub! 12 Responses to "Someone Bought This: WWF President Jack Tunney trading card"
Furthermore, this is an awesome trading card. Bullet point #3 – Drinking partner of Vince McMahon, Sr.
Unequivacabally it is heretofore my judgement that I render this proclamation to adjudicate the situation at which is at hand in this most dire of circumstances. I don’t even remember what I was talking about. Mean Gene pass me the script…and the bourbon…hold the script. Tunney is better than any living president. That is all. I actually think this is a kind of cool piece of merch. Jack Tunney poses for trading card photo.